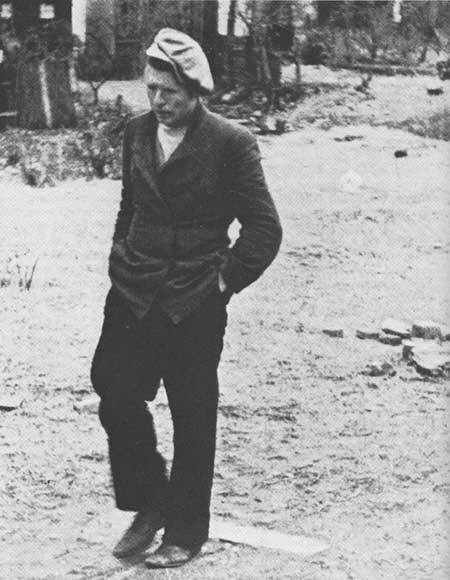 The first storm clouds of the Great Depression began to show themselves in 1927, if not earlier. But most people did not recognize them. In 1927-28 the bottom started falling out of the resort development business along the Mississippi and Alabama Gulf coast and in Florida, which had been experiencing one of the greatest land booms this country has known. By the time Hoover took office as president in 1929, the depression had begun to spread like wildfire, and it spared nobody. Even the biggest red plums on the trees of prosperity fell to the ground to rot. Land investors were trying to get back ten cents on the dollar, but there were no buyers. Private enterprise and government alike were letting employees go and cutting salaries. Contracts were being canceled, and resort to court action was useless. The stock market went bust. Everybody was trying to lift himself by his bootstraps. No new year ever dawned with less hope than 1933. The Great Depression, having grown progressively worse for three long years, had spread a pall of fear and desperation across the whole land. The new year brought no promise of abatement, only the prospect of more of the same. . . . The physical signs of distress were everywhere. You encountered them with wearying monotony day after day: clusters of hungry men and women waiting like docile peasants for food handouts at the relief stations; the smokeless chimneys and rusting sheds of factories standing mute and empty behind their locked gates; the abandoned shops and stores, their doorways littered with trash, their grime-streaked windows staring vacantly upon half empty streets; the drooping shoulders of a father, husband, brother, or friend whose pride had been battered into lethargy and dejection by months of fruitless job hunting; the panic and anger of the crowd milling before a bank entrance on whose door a typed note stated, "Closed until further notice by order of the Board of Directors." But even worse than this visible evidence of breakdown was the knowledge that it was everywherenot just in your town or your state or your part of the country. The blight spread across the whole nationbig cities, small towns, and limitless countrysidelike a deadly plague of the Middle Ages. Nor were its victims just certain kinds of people. They were farmers, bankers, carpenters, lawyers, factory workers, preachers, chorus girls. Every class, it seemed, except the poor Negroes in the slums who had never known anything but hard times anyway, was stricken in some degree. But even those who still had jobs or income lived with a hot ball of fear in their gut that tomorrow their luck would run out. "What will I do then?" sprang equally from the tortured clerk behind the counter and the merchant behind his desk. Worse still was the knowledge that there was nothing you or your boss or the governor of your state or the President of the United States could do about it. All the towers of wisdom and strength on which you were accustomed to lean had crumbled. The roots of your faith in the American way and even, perhaps, in the benevolence of God, had begun to wither like a vine too long deprived of rain. You felt trapped, like an animal in a cage, as some malevolent force that you could neither comprehend nor fend off inexorably worked to destroy your whole scheme of life. And in these early weeks of the new year 1933 you felt that the climax was approaching. Things were happening that seemed to warn, like thunderclaps in the hot night sky, that the storm was about to loose its furies. Symbol of the Great Depression of the 1930s: "...a father, husband, brother, or friend whose pride had been battered into lethargy and dejection by months of fruitless job hunting." Well, the storm was about to break, but it was a good storm. It went away, and the sun came out, brightening up homes throughout the country. On March 4, 1933, a new president, Franklin Delano Roosevelt, took the oath of office. Every seat in the stands was taken on that inauguration day, and people by the thousands crowded in front of the platform and lined Pennsylvania Avenue. Americans throughout the land heard on the radio the words of the new president. This is a day of national consecration, and I am certain that my fellow Americans expect that on my induction into the Presidency I will address them with a candor and a decision which the present situation of our nation impels. This is preeminently the time to speak the truth, the whole truth, frankly and boldly, nor need we shrink from honestly facing the conditions in our country today. This great nation will endure as it has endured, will revive and will prosper. In the days that followed, the Washington scene was abruptly transformed from the quagmire of torpor and bewilderment that had gripped it for the past six months into an arena of spirited activity. . . . The Roosevelt Administration's fabled "Hundred Days"probably as crucial a brief epoch as any in the nation's historyhad started. They were to dissipate the panic of the Depression, even if they would not break the back of the Depression itself. In virtually his first official act in office, initiated within hours of taking the oath, the President decreed a national bank holiday, shutting down every financial institution in the land, and called a special session of Congress to convene within four days. Simultaneously, a dozen task forces were at work drafting one of the most revolutionary legislative programs ever essayed by any President. Between March 9 and June 16, Roosevelt would propose and Congress would pass fifteen "emergency" acts, which, in their totality, would drastically affect the nation's social and political orientation far into the future. Some of these laws were temporary stopgaps, and some would in time be struck down by the courts, but fully half of these "emergency" enactments remain embedded in the statute books today. Never before had such a legislative miracle been wrought in so short a time. "Whatever laws the President thinks he may need to end the Depression," Senator Burton K. Wheeler of Montana said on Inauguration Day, "Congress will jump through a hoop to put them through." His prophecy was fulfilled. 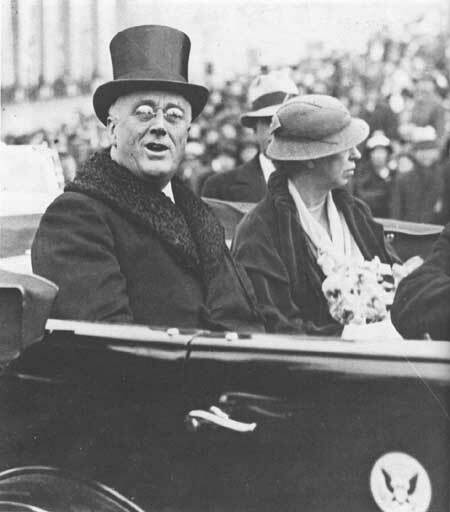 Franklin Delano Roosevelt and Eleanor Roosevelt on the way to the White House after the inaugural ceremony on March 4, 1933. Courtesy National Archives. Whatever the causes and cures of the problems of the depression might have been, the immediate and most pressing responsibility of the government was to put men back to work. It was absolutely necessary to bring an end to idleness and to restore family incomes, even in a small measure, in order to strengthen the national morale, avert panic, and at the same time create a breathing spell that would permit the mobilization of the nation's forces for a systematic study and correction of the underlying causes of the depression. The broad outlines of the New Deal program had been spelled out by F. D. R. in his campaign, and he brought to Washington not only a sizable portfolio of policy papers and legislative proposals but also a crop of aides and experts capable of putting his plans into effect. That same night [of March 4], after the Cabinet had been sworn in, the new President sat down in the unfamiliar surroundings of the White House with Woodin, Moley, Cummings, and a handful of other advisors, and made a series of momentous decisions that were to set the Hundred Days off from any similar period in American history. . . . The first decision was to go through with the plan of declaring a national bank holiday; the second, to call Congress into special session to deal with the bank crisis; and third, to summon a group of leading bankers to Washington immediately for any advice they could give in the emergency. . . .
By 10:00 o'clock that night (Sunday) the necessary proclamation and orders were issued (thoughtfully postdated 1:00 AM Monday to avoid profaning the Sabbath). Effective immediately every bank in the nation was closed for four days, the shipment of gold and silver was embargoed . . . and Congress was under orders to convene at noon on Thursday, March 9th. It had originally been Roosevelt's intention to send Congress home once the emergency bank bill was passed, because he thought that his new Administration needed a chance to get the feel of the job and to devote a lot of care to the drafting of the legislative program. But the momentum and the good will generated by his swift handling of the banking crisis was too valuable an asset to be wasted. Tugwell urged him to rush for passage of the farm bill while he still had Congress in his hand, and Lew Douglas urged with equal vigor that now was the psychological moment to strike a blow for economy and fiscal "soundness." Roosevelt, aglow with optimism and impatience, said "Why not?" and picked up Senator Wheeler's option. I won't go into details of the bills that passed and other actions taken in the famous "hundred days," but I will list the bills, the executive orders, and their dates: (1) We've seen that the bank bill became law on March 9, without congressional hearings. (2) The Agricultural Adjustment Act was introduced March 16 and enacted May 12. (3) The Civilian Conservation Corps Act was introduced March 21 and enacted March 31. The CCC was an original idea of FDR's, stimulated by his long interest in forestry and conservation in general. He proposed to take 250,000 unemployed young men off the streets and welfare rolls and give them jobs at thirty dollars a month, plus their keep, to do useful work primarily in the federal and state forests and parks. According to Phillips' Chronicle, "This work program of youths was the first and most widely approved of a variety of work relief programs that were to follow." Within a week after enactment boys were being enrolled by the thousands and the first CCC camp was being constructed near Luray, Virginia. (4) The Federal Emergency Relief Act was introduced March 21 and enacted May 12. (5) The Farm Credit Administration Act was introduced March 27 and enacted June 16. The FCA was initially established by executive order of the president. (6) The Truth in Securities Act was introduced March 29 and enacted May 27. (7) The Tennessee Valley Authority Act was introduced April 10 and enacted May 18. (8) The Home Owners Loan Act was introduced April 13 and enacted June 13. (9) By an executive order of April 19 the gold standard was abandoned. (10) The Railroad Coordination Act was introduced May 4 and enacted June 16. (11) The National Industrial Recovery Act was introduced May 17 and enacted June 16. (12) The Glass-Steagall Banking Act was introduced May 17 and enacted June 16. (13) The Annulment of Gold Clause in Contract Act was introduced May 26 and enacted June 5. The tide turned with Roosevelt's swift and decisive action as he took office. Despair turned into hope and faith and confidence reached a peak as the Hundred Days came to an end. The Chronicle goes into much greater detail, but the above should be enough to set the stage for a look at the National Park Service at the beginning of the New Deal. Size of staff was at a low ebb. Salaries were low; in 1932 they had been cut 10 per cent across the board. But we were all glad to have jobs and plenty of work to do. When the CCC and other New Deal programs began, we were happy to be a part of them and to put in long hours, far into the night, with a sandwich and coffee at our desk for dinner. We got great satisfaction in providing jobs for others. Highly qualified professionalsarchitects, landscape architects, engineerswere available in all the fields needed to carry out our programs successfully. I remember one well-known landscape architect who wrote and said he was coming to Washington, hoping we could give him a job. Before we could reply he showed up in our office. We told him we could use him at the Richmond district office, which we were just setting up. He jumped at the chance, signed the necessary papers, and left the office to drive to Richmond so that he could start work the next day. In about fifteen minutes he was back with the sad story that somebody had broken into his car and stolen his suitcase and satchel, which contained all of his clothing and thirty dollars, the last money he had to keep him going until payday. We took up a collection and sent him on his way with about twenty dollars. He left an IOU and returned the money in sixty days. The legislative accomplishments of Congress in its three-month session that marked the beginning of Roosevelt's New Deal were astounding, but the machinery to operate these programs still had to be organized by the administration and put to work. Of course, there was a lot of discussion of what might happen, whether the new secretary of the interior would want many changes, whether the whole department would be reorganized, or whether the old bureaus would be given additional responsibility. After the inaugural address on March 4 all agencies of government seemed to take on an aggressive attitude, a feeling of "What's my job? Let me get on with it." Just listening to the president's fireside chats was an inspiration. 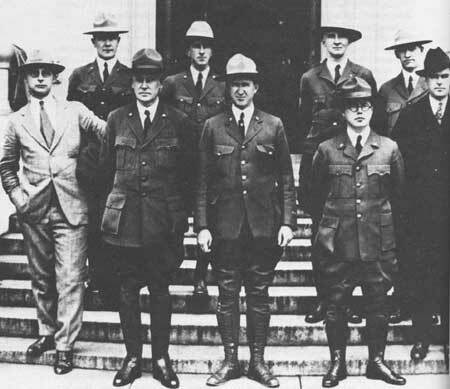 The Washington staff of the National Park Service in uniform in 1926. Left to right: Arno B. Cammerer, assistant director; Harry Karstens, superintendent of Mount McKinley National Park; Stephen T. Mather, director; Charles G. Thompson, superintendent of Crater Lake National Park; Horace M. Albright, superintendent of Yellowstone National Park; John R. White, superintendent of Sequoia National Park; Arthur E. Demaray, assistant director; Ernest Leavitt, assistant superintendent of Yosemite National Park; W. B. Lewis, superintendent of Yosemite National Park. I was talking to Judge Finney last night and he told me that he was one of the men who drafted the $500,000,000 bond issue relief bill. He said that it is to be administered by the Secretaries of War, Interior and Agriculture. It contains authority for almost all kinds of public works, including road and trail building. He said the word "reforestation" will permit the cleaning up of old forests, removing dead and down timber, installation of protection facilities, as well as planting of young trees. I suggest that you wire Coffman to get up a reforestation or forest improvement budget for the Park Service, this is to include cleanup of construction areas, of timber around the west entrance of Glacier Park. It should also include cleanup of reservoirs such as Jackson Lake and Sherburne Lake in Glacier Park. There is no way of course of telling how much money will be allotted to the National Park Service. It will all depend upon the showing we make as to the need of the people in the neighborhood of the parks and the plans that we have for doing the work. Also we can point out that in Grand Canyon and Glacier we could use large numbers of Indians on roadside cleanup. Obviously there was a lot of guesswork in Albright's memorandum, but he was out to get information in order to justify a good, sound park program should the funds suddenly become available. The idea of creating a Civilian Conservation Corps wasn't an overnight decision. On at least four occasions before assuming the presidency, Roosevelt had outlined in public addresses certain ideas that appeared to presage his recommendations concerning the establishment of the CCC. In his acceptance speech in Chicago he stated that he had very definite plans for the conservation of human and natural resources on a national scale. Then in a speech he gave in Atlanta he gave his views concerning the conservation of forests. That was followed by a talk he gave in Boston in which he proposed a plan for employing men at public works that would benefit the nation. Finally, in his inaugural address he reiterated his views on putting the unemployed to work on projects that would be of value to the nation. Of course, we all knew that as governor of New York he had been very much interested in forest preserves. I am asking you to constitute yourselves an informal committee of the Cabinet to coordinate the plans for the proposed Civilian Conservation Corps. These plans include the necessity of checking up on all kinds of suggestions that are coming in relating to public works of various kinds. I suggest that the Secretary of the Interior act as a kind of clearing house to digest the suggestions and to discuss them with the other three members for this informal committee. I have nothing in my records that would indicate just what this committee did; but I would assume, inasmuch as the first bill was introduced on March 13, withdrawn, and reintroduced on March 21, that the changes made in the bill during that week were the result of recommendations made by this committee of departmental secretaries. It actually took eighteen days for the CCC act to get through Congress; that is, eighteen days from the day the first bill was introduced on March 13 until March 31, when the president signed the act. Still, that was very fast in terms of legislative enactment.